Alaskan Snow Crab is meaty with a fresh, bright and salty taste. 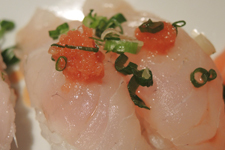 Hal­ibut is a sweet, sub­tle and del­i­cate white fish served with daikon oroshi, green onions and a bright ponzu sauce. Monk­fish liv­er which we mari­nade and steam our­selves. Lim­it­ed avail­abil­i­ty based on ven­dor avail­abil­i­ty. Topped with daikon oroshi, green onions and ponzu. 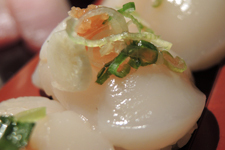 Sourced from the cold waters of Hokkai­do, Japan, our scal­lops are sweet and mild. 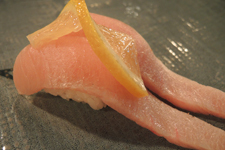 Deli­cious as nigiri, sashi­mi or ask for them to be made as a roll.